Amazon Price: $17.73 (as of February 12, 2019 3:40 am - Details). Product prices and availability are accurate as of the date/time indicated and are subject to change. Any price and availability information displayed on the Amazon site at the time of purchase will apply to the purchase of this product. Turn yourself into a work of art with Tulip Body Art Face and Body Paint! This cosmetic-quality, creamy paint applies smoothly and effortlessly with fingertips or a brush so you can easily create the perfect eye-catching looks for everyday fun or special occasions. With Tulip Body Art, YOU are the work of art! 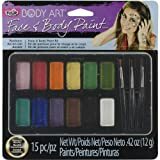 The Rainbow Kit comes with 12 Face and Body Paints and three paintbrushes.